Here are 4 sample illustrations I did for Toronto’s Broken Pencil Magazine circa 2000. I’d be given a short story & asked to interpret it in one cartoon panel to accompany it in print. I’ve unfortunately forgotten the stories by now but it’s fun to try to imagine what they were about judging by these odd scenarios. Reminiscent of Factsheet Five, Broken Pencil features reviews of zines & small press books, comix, excerpts from underground press, interviews, original fiction & commentary on all aspects of the indie arts. Published 4 times annually since 1995, “Broken Pencil is the entertaining, indispensable guide to zines.” – the Toronto Star (To see full-sized, keep clicking on an image to open it in a new window & use the magnify function). Four original art pieces for sale at $50.00 CAD each. Two are pencil on paper & two are ink on paper. Postage & framing not included. Motion Picture Purgatory Volumes One & Two available at FAB Press. 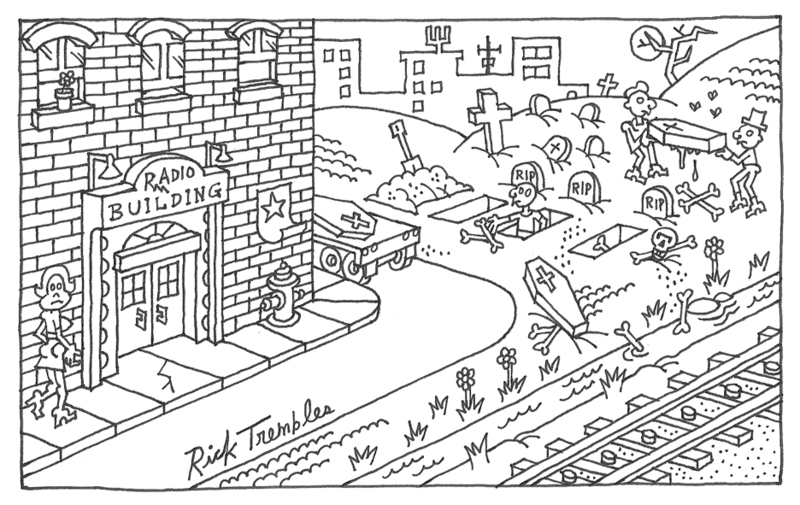 For original art info, contact Rick Trembles @ ricktrembles (at) hotmail (dot) com.